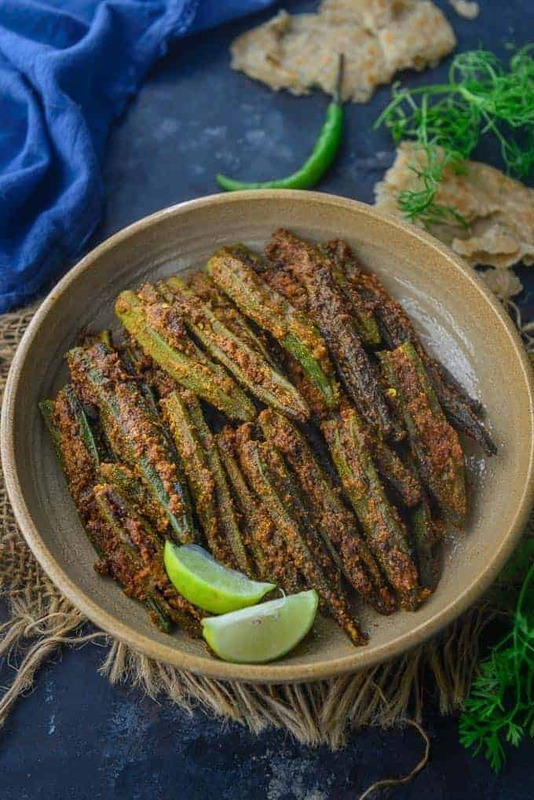 Bharwa Bhindi is lady’s fingers stuffed with a tangy and spicy masala mix. It is easy to make, vegan and gluten free. Here is how to make Bharwa Bhindi Recipe. Everyday food for us is usually a dal, a dry sabzi, salad and roti. With the variations that can be done with dry sabzies and dal, it’s almost a new menu everyday. Bhindi is a vegetable which everyone in family loves and so it frequents the lunch table quite often. 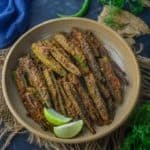 Kurkuri Bhindi, Bhindi Masala or this simple Bharwan Bhindi stuffed with dry spices are a few variations which are loved by all and the serving plate is wiped clean every time I make these. The stuffing in this recipe is a simple mix of everyday masalas with dry mango powder giving a characteristic tangy flavor. Here is how to make this delicious recipe. Bharwa Bhindi is a Punjabi dish which is nothing but stuffed Okra. It can be stuffed with dry spices and cooked in little oil or the stuffed okra can be cooked with a onion and tomato masala to make Bharwa Bhindi Masala. This dish is an Indian favourite and can be made at home using basic ground spices. 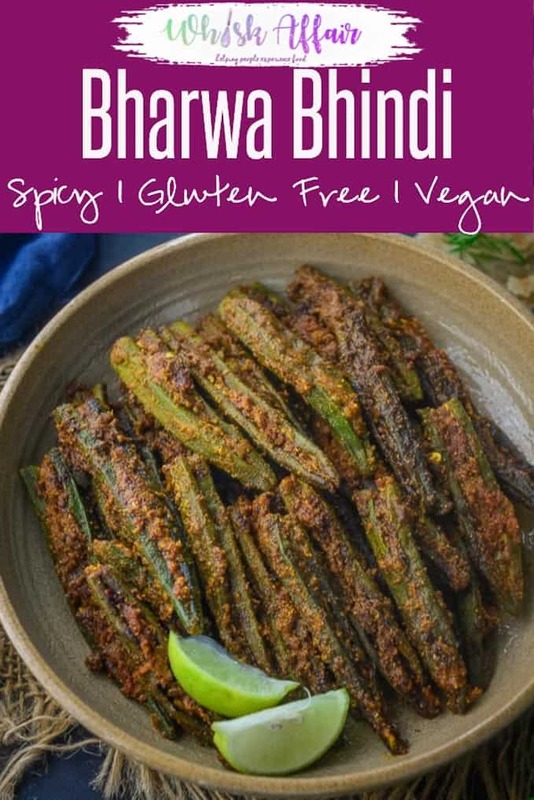 How to make Bharwa Bhindi with Besan? To make Bharwa Bhindi or stuffed bhindi with besan, 2 tbsp of roasted besan is added to the spice mix and stuffed in the bhindi. The bhindi is then as mentioned below. How to make Bharwa Bhindi Masala? Stuff the bhindi as mentioned in the recipe below. Cook it as mentioned in the recipe below. Add another 2 tbsp oil in a pan. Now add onion, ginger and garlic and fry for 3-4 minutes until onion turns translucent. Add green chillies and tomatoes and cook for 2-3 minutes. Add the cooked bhindi and mix well. You can make Bharwa Bhindi Masala as mentioned above. Bharwa bhindi with Besan is another option. Add 1/4 cup of desiccated dry coconut in the filling for a different taste. You can also crushed ground nut or a mixture of ground nut and coconut in the stuffing too. Make sure to wipe the bhindi well before stuffing it otherwise the dish will become soggy. Use a big shallow pan to layer the bhindi and always layer them in a single layer. You can even use a dosa tawa to make stuffed bhindi. Cook the bhindi open. Do not cover the pan. Turn the bhindi after every 2-3 minutes until they are done. It will take approx 15 20 minutes for the bhddni to get cooked properly. Cook the bhindi on low heat. Bharwa Bhindi is lady's fingers stuffed with a tangy and spicy masala mix. It is easy to make, vegan and gluten free. Here is how to make Bharwa Bhindi Recipe. Wash the bhindi and wipe them dry with a clean kitchen towel. Remove the cap and the thin bottom part. Make a slit in the bhindi lengthwise. Mix all the dry masalas in a bowl. Add 1 tbsp mustard oil in the masala and mix well. Stuff the dry masala mixture in the slit made in bhindi. Stuff all the bhindies in the same manner. Heat oil in a heavy bottom shallow pan. Keep turning the bhindi after every 2-3 minutes until they are done. Keep the heat to low and let bhindi cook on very low heat for 15-20 minutes. Serve hot with parathas or Dal and Roti. Hey Neha… your posts on FFA drove me to browse more about you and your work and absolute delight it is to see and try your dishes. The love and passion with which you make some mouth watering dishes clearly shows the heart and soul that u put into the activity. Keep up the good work. Love and cheers to you!!! !